We have had the occasion to meet each other during the Second Black Drop’s Meeting (Goccia Nera) held in Gallarate (VA), near Milan, in the north of Italy. During these days Pietro was so kind to invite me in his office where there is this incredible aquarium. A tank of 250 cm wide per 80 and 70 cm high. 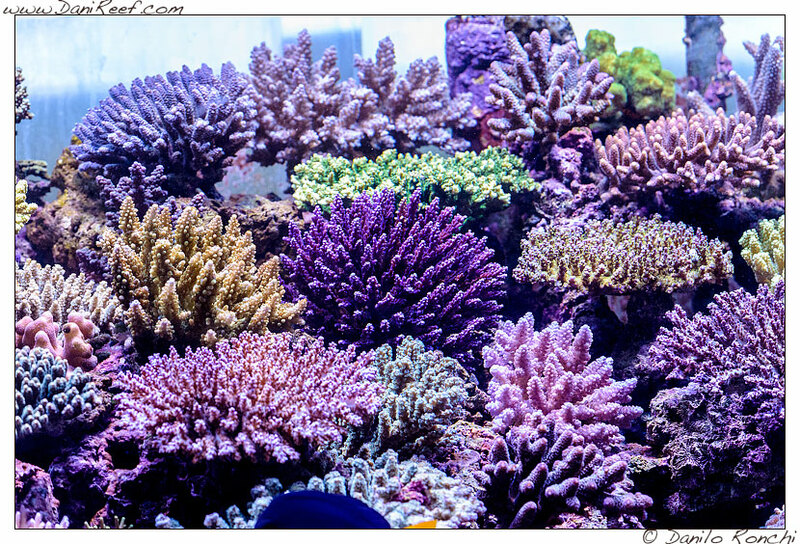 Almost 1.400 liters of marine water… and wonderful corals. 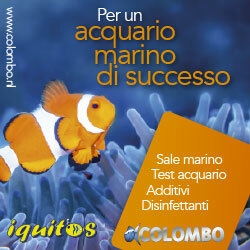 The Pietro’s Aquarium embodies my personal ideal of “the perfect aquarium“. Huge, for what I’m used to see, and I’m so sure that we can get used to these dimensions when we have it at home, but the aquarium is filled with great fishes, many surgeonfishes, a huge Acanthurus sohal, a couple of Acanthurus achilles, one Acanthurus leucosternon (one of my favorite fish), one wonderful Zebrasoma gemmatum but then Zebrasoma xanthurum and flavescens… not to mention one beautiful Pygoplites diacanthus, of which we can see some nips over a few corals. What else to add if not some pictures? 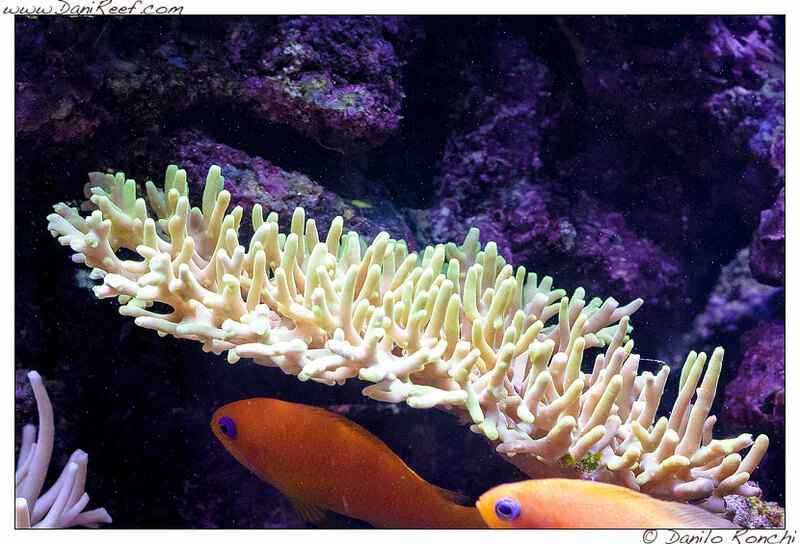 The aquarium is really huge, and the Rocks is just a little old style, and watching it through the glass it seems a perfect copy of the Red Sea floor. It’s far from the excesses of the new Zen style aquariums that’s so much like to aquarists, the tank is extremely natural, and I think this could be the greater compliment we can say about this aquarium. 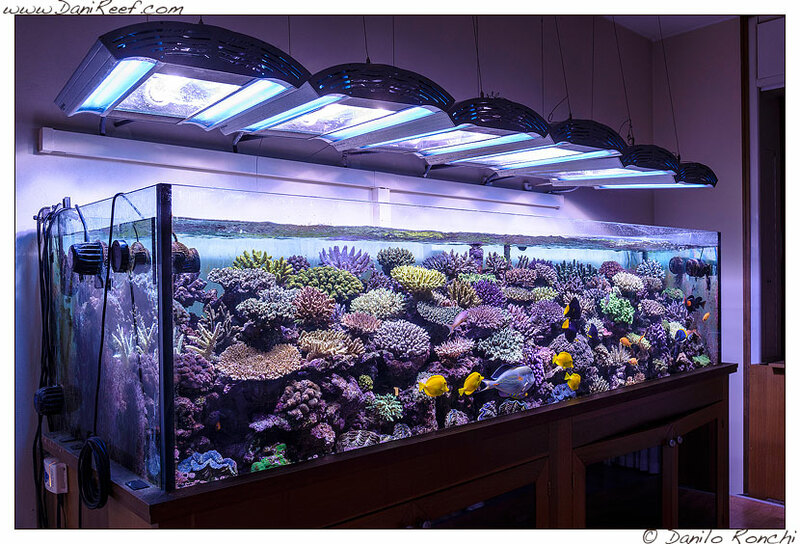 The first thing we, and all the aquarists like us, will notice when watching this tank, are the ceiling lights that enlighten the aquarium. Six HQi ceiling lights from Giesemann, six lamps of 400 watt of metal halide over the corals, without forgetting the twenty four T5 neon lamps of twenty four watt. 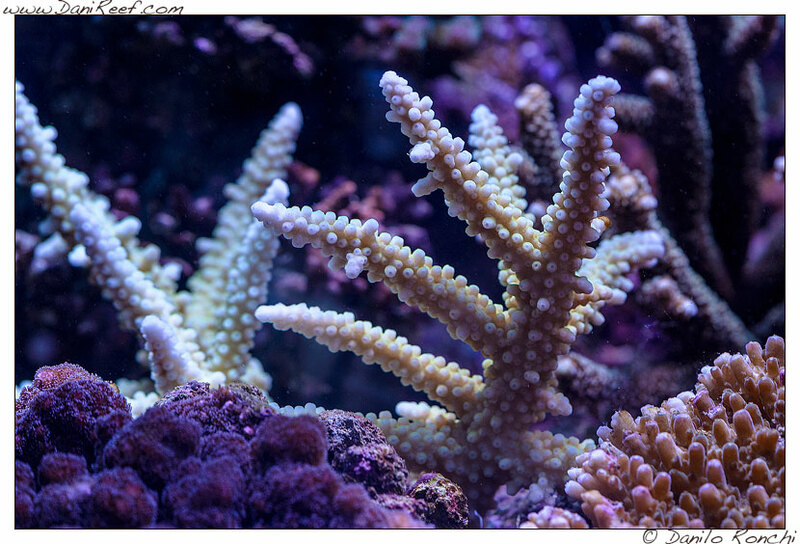 A huge amount of light that shows all his beneficial effects over corals and all the aquarium system. 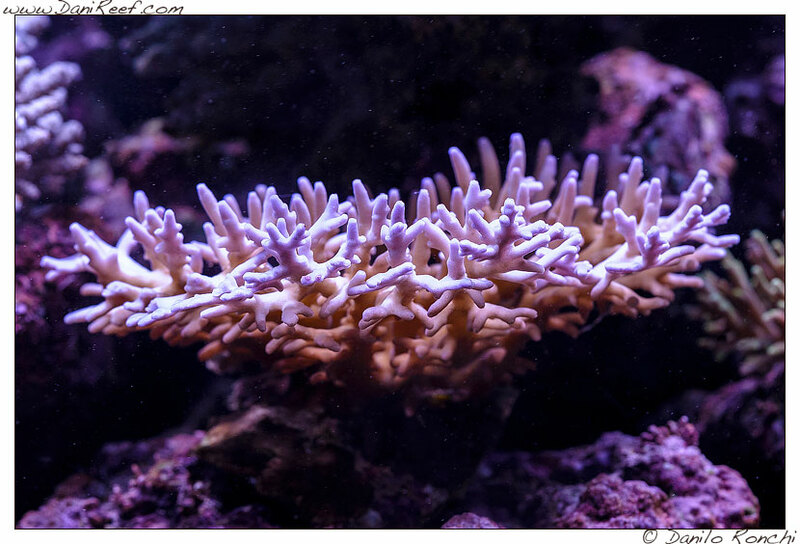 We can say for sure that the first goal of this aquarium has been the growth and wellness of all the animals inside it, a tank where we can find so many fishes and so many particular corals, almost every tubular acroporas, and where so many wild Acroporas are in the lion’s share. But, as we can see, the wild Acroporas are everyone, or almost everyone, grown up inside this aquarium. Well, I think that looking through these pictures could be difficult to perceive the size of the animals, the harmony between their branches, and someone could also think that all the animals could be placed directly from the shop inside tank just before these pictures. Well not. This is not true. 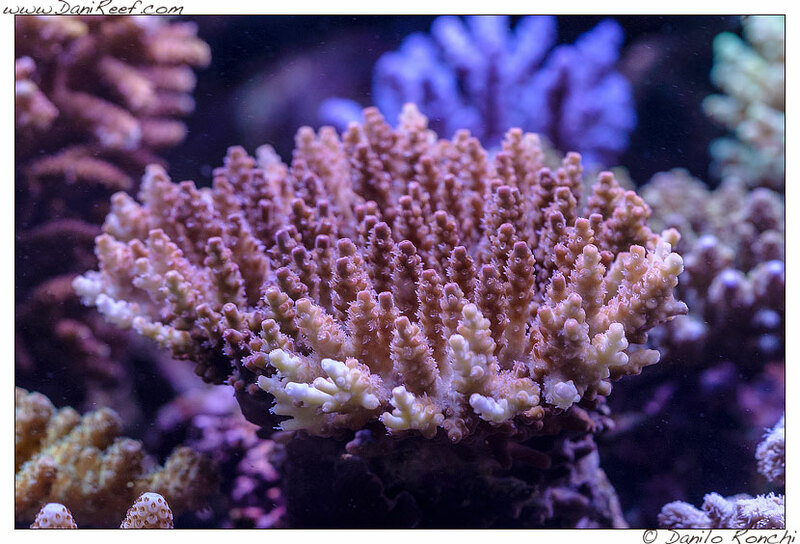 We have had the chance to see old pictures of this tank and many corals were in the same place, but also we can’t understand how it can be possible to perfectly fit all these corals so near each other without having any problem. 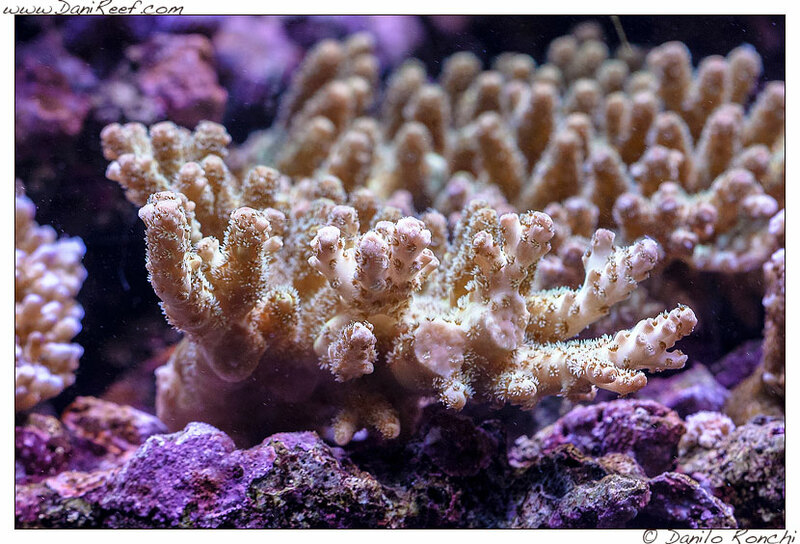 More on this we can distinctly see the bites, the nips, in some parts of corals, these parts are now white or covered by algae, so, believe me, this is a true tank. The bigger part of wild Acroporas are grown inside the Pietro’s aquarium, and they have enlarged their dimensions, as you can see from pictures and video, and they could integrate each other in a very harmonious way. It’s a perfect biotope from this point of view. If you can’t appreciate this aspect, sure you’ll be able to watch the video in the last page, because I think that only using the two media together it’s possible to understand these animals, and their together growth. 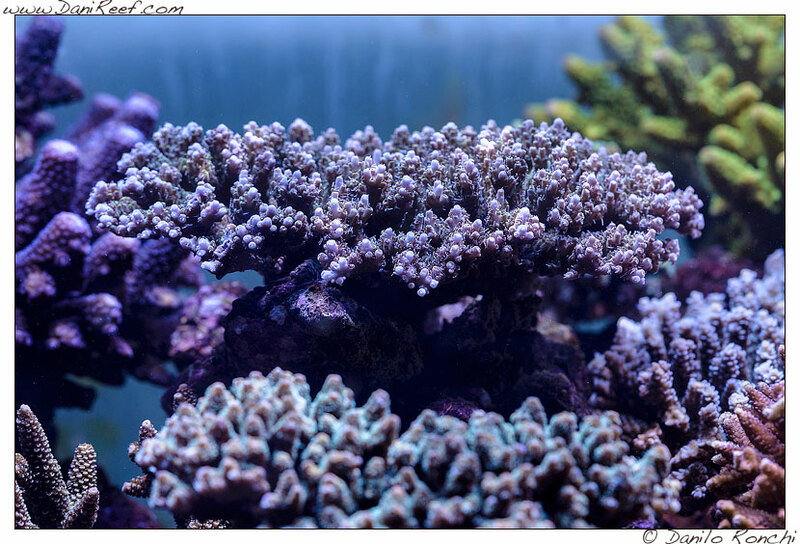 The beauty of this aquarium is not in a very incredible single piece, also if there are some very remarkable corals, but in the layout we can see. 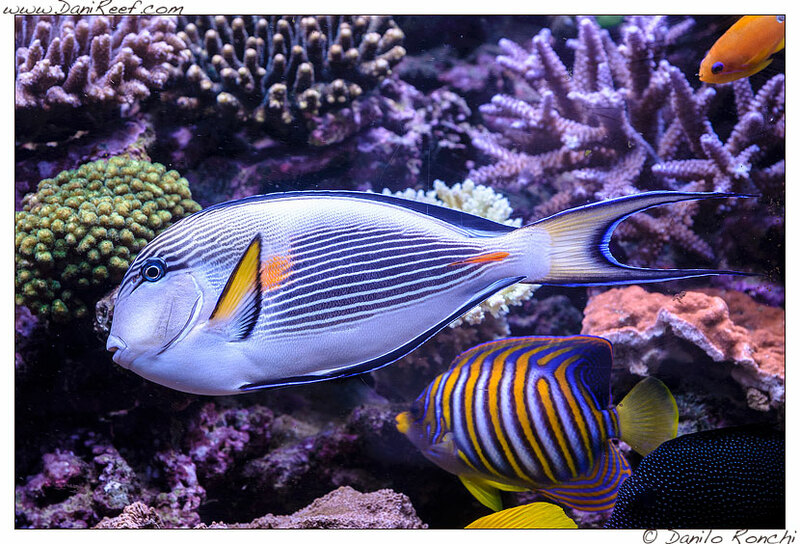 It is everything so natural, watching this aquarium we could think that everything is where it has to be. But we have not to forget the incredible number of fishes ad their size. The Acanthurus sohal is impressive, and in my humble opinion, I have to say that also this huge aquarium is too small for a surgeonfish of this size. We have spoken a lot with Pietro, also if our friendship is a long term one, to understand his idea about the management of the aquarium. 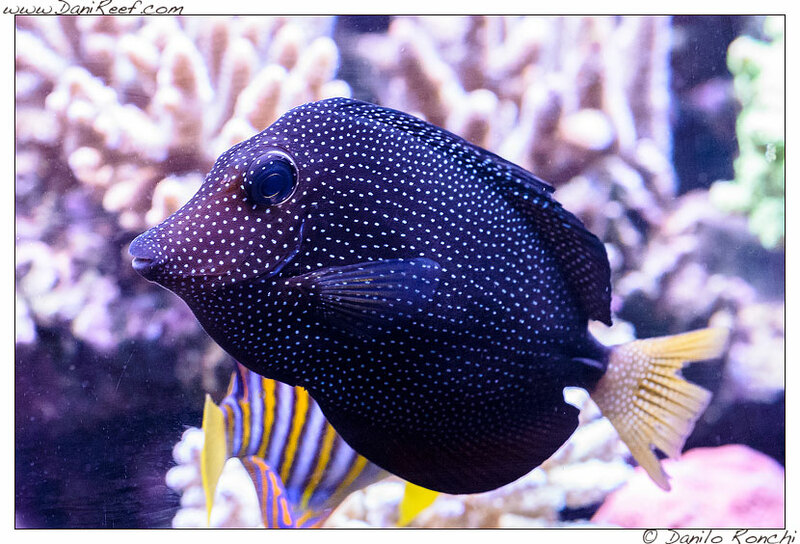 Here we can see a beautiful Zebrasoma gemmatum, a rare fish not so easy to see inside a domestic aquarium, for example there was only one of these fish during the last Interzoo in Nuremberg inside the De Jong Booth.